As Sth Aust's renewable rubbish staggers from blackout to brownout every other week when the wind stops SA is now seen as the canary in the coal mine for power generation. Mal is carefully avoiding saying YES to new coal generators to avoid the extremist Greenies going ballistic and possibly causing a loss of votes. Federal Energy Minister Josh Frydenberg has signalled the coalition government could financially back new power generation as part of a suite of measures to tackle skyrocketing power costs. The Australian Competition and Consumer Commission has recommended the government underwrite new power plants to help companies who haven’t been able to get finance. Mr Frydenberg said the competition watchdog had identified a failure in the market but stressed the ACCC’s report had not favoured any particular technology. “What they’re saying is the government needs to step in here provide some sort of assurance,” Mr Frydenberg told the Nine Network on Thursday. Some Nationals and Liberals have claimed the recommendation is vindication for their push to build new coal-fired power plants. But Mr Frydenberg said it could include coal, gas, renewable energy or battery storage. Labor’s energy spokesman Mark Butler said there was no appetite in the business community to invest in new coal-fired power generation, with or without government support. “The coal ideologues in the coalition partyroom have effectively hijacked what is quite an important and serious recommendation,” Mr Butler told ABC radio. Deputy Nationals leader Bridget McKenzie said science should determine which technology would get the best outcomes for power bills. “We have to walk away from the evangelical attachment to one particular fuel source for power generation over another,” Senator McKenzie told Sky News. The ACCC’s report, which sets out a blueprint to cut 25 per cent from electricity bills, got warm support from Prime Minister Malcolm Turnbull when it was released on Wednesday. “Australians are crying out for an energy policy that is focused on them,” Mr Turnbull said. A key measure involves forcing retailers to offer a benchmark price near the middle of the market, to end confusing and deceptive discounts. ACCC chair Rod Sims estimates bills could drop up to 25 per cent for the average household if the report’s 56 recommendations are all implemented. Business lobby Australian Industry Group welcomed the voluntary write-down of the value of state-owned electricity networks but was unsure about the plan for the government to underwrite new power generation. Mr Turnbull will talk to the states about the ACCC’s recommendations, as he also tries to get them to sign up to his national energy guarantee, which is aimed at dropping prices, guaranteeing reliability, and cutting emissions. Mal will just dither along, afraid to challenge the loony right in the COALition. Renewable energy is cheaper than fossil fuel generated energy. That will see coal lose market share. Yes, storage is needed with renewable energy but that will be done. The coal fleet is ageing and not reliable—the battery in SA has already kept network frequency at the right level when a coal generator crashes off line. HBS Guy wrote: Mal will just dither along, afraid to challenge the loony right in the COALition. Donald Trump is playing the same time game as Turnbull. Do they have to do anything in their reign? A trap people fall into is the amount of energy produced. A coal generator produces a massive amount of energy whereas the renewable rubbish produces only a tiny amount of energy intermittently. So to imagine sloppy woppy windymills can actually replace a coal generator feeding something like the Tomago aluminium smelter is just naive. The SA Tesla battery joke is ONLY a TINY 100MW whereas the SA load is about 2000MW - so there would a smoke signal on the horizon if the tiny 100MW Tesla battery joke was connected to this load. Tony Abbott has been flogging this patently obvious point for some time now. To say the renewable rubbish is cheap is naive because it is being propped up by govt subsidies. To actually match the Liddel coal power station feeding Tomago aluminium smelter would require a massive huge windymill farm over many square kms which would cost the earth and would require constant costly maintenance and would conk out in about 20 years after producing shoddy rubbish power. Why are there about a 1000 or so NEW clean HELE coal generators being built around the world even as we speak ? And using OUR clean coal!!!!! The battery nevertheless kicks in almost instantaneously to keep the network going until another fossil fuel generator can kick in to replace the one that fell over and fall over they do. We do need to reduce emissions so renewable energy is a natural fit. Would also lead to less emissions, cleaner skies, less respiratory diseases etc. Couple with move to electric vehicles (not hydrogen) and more energy efficiency renewable energy is a natural. You seem to be going in circles. As SA has already gone down the path to ruin with the renewable rubbish it is the logical place to examine. You talk about coal genes falling over ? In SA there are NO coal genes left. What dies in SA is the windymills when the wind stops every other week or so. At this point there is an urgent swing over to the lifeline from the coal genes in Victoria as well as kicking over various diesel genes in SA. You harp back to the toy 100MW Tesla battery in SA. SA's load is about 2000MW so what do you think would happen if you connected a 2000MW load to the tiny toy 100MW battery ? Smoke flames and a totally destroyed toy Tesla battery. All the tiny toy Tesla battery can do is backup the tiny solar farm nearby. You see why a working knowledge of electricity generation is required to see what a disaster this renewable rubbish really is. Now go back to Liddell supplying the very heavy load of Tomago aluminium smelter which requires a continuous reliable supply of power as the aluminium freezes in the pots if the power fails. Liddell has a 2000MW output and the Tomago smelter uses about 300MW of that. Can you just imagine the tiny toy 100MW Tesla battery supplying that load ? The battery would be melting along with the aluminium!!!! Renewable rubbish is only light weight secondary power. The real big primary power has to come from either hydro or coal. And an interesting aside is that the Snowy Mountains is running out of water now that it is replacing the closed down Hazelwood coal generator. The extremist Greenies will be excited to see their insanity reducing Australia to a 4th world country just like Sth Aust. You have no idea what the battery is for. Maybe do some research and report back? Mere verbiage amd propaganda is not quality and we like to think we are a forum of quality content. only the stupid libtards would suggest building a coal powered generator despite being told by ALL the energy suppliers that renewables is the way to go. Libs need to stop taking donations from coal mine operators and listen to the experts. a battery is a battery and simply stores energy. The capacity of this Tesla battery is ONLY 100MW. It is supposed to backup a wind farm nearby which it probably would do fairly well altho the MWH is not quoted so don't know for how long it would last. Clearly with such a tiny capacity it CANNOT supply the whole SA network load of about 2000MW. The SA network MUST synchronize with freq and phase to the Vic coal generator as it is connected to it. There are numerous emergency diesel genes on the SA network. The battery is paired to the neighbouring Hornsdale Wind Farm, owned by French company Neoen, to bring greater reliability and stability to the state’s electricity grid. It has the capacity to power 30,000 homes for up to an hour in the event of a blackout, but is more likely to be called into action to even out electricity supplies at less critical times. A good run down on the little bit it will do is outlined here. So following your advice I have looked it up and that has only confirmed what I have said all along - it is just a tiny toy battery which is virtually useless in the event of a major blackout. All it does is back up the local wind farm and supply little bits of energy at peak times - otherwise it is quite useless. If you would care to explain what it is I have missed I am only to happy to learn. no, the battery is there to 'jump start' the power generators when the system goes down as well as help regulate short term fluctuations in power supply. I already explained how the battery almost instantaneously acts to keep network frequency at the correct figure until another generator can be brought online to replace the generator—usually a coal fired one—that fell over. The battery also stores and sells small amounts of power and makes money for the owner doing that. It is NOT meant to power tens of thousands of houses for a long period. More batteries are being installed in NSW for similar purposes. You need to brush up on your research skills Julia, involves more than copy and paste! Now the battery is 135kwh not 100, so at least get your insults right. The article u posted was done 6 months before the battery even started. The 'peaker plant' part of the battery is half, the SA government payed for 50 million dollars. In the first 6 months of it been in operation levelling the power supply , its been estimated to have saved the SA population about 30 million. The battery is quarantined for 10 years, should last 15 years. so a 50 million investment will save 600 million. so just work on 100mwh (has a 135mwh capacity) a day for the battery = 36500 mwh a year. the battery will power 6000 homes for 24 hours a day. 111 million in 10 years. Don't forget u need coal to keep our power stations going. Considering no coal plant in Australia has any filters on them to get rid of the poisons. I know i wouldn't want to be near one. U keep mentioning a coal power plant with 2gw capacity. a new one will cost about 6 billion dollars and need coal to be supplied for its life. The Tesla battery cost the SA government 50 million and in six months has saved 30 million. At least when u argue about something put in a bit of prospective. ALthough having said that, most blackouts only happen becouse of storms. The battery is guarantied for 10 years, should last 15 years. ok lets look at the aluminium smelter... u say it needs 300mwh to run. ok lets go coal first. 1.8 billion dollars for the plant. coal costs about $70 a mwh or $70,000 a gwh. 2628 qwh for the year will cost 184 million. Say the plant lasts 20 years. 3680 million dollars. Maintenance also if its a new coal plant the filters need replacing every year at millions of dollars plus shut downs we will ignore. and 1 million for 1.3 mwh of battery storage. Lets double up on wind and solar to be safe. 300mwh (to do 7.2 gwh a day) of wind will be 540 million dollars. with solar figuring on average of 4 hours a day is 1800 mw (to do 7.2gwh a day)at 1.800 million dollars. Say 4gwh of battery storage. (13 hours of the smelter operation) a 3.200 million dollars. so wind .6 billion, solar 1.8 billion, battery 4 billion = 5.6 billion dollars. Also very little maintenance is needed for the battery wind and solar. especially the costs of energy storage...... it could easily halve again in the next 10 years. the costs of getting coal will only raise. The blackout of SA happened because the owner of the privatised network has been cutting corners. Windfarms will be managed differently now when storms are blowing. I would love to see a nice big nuclear generator near Pt Augusta selling power to Vic & NSW as well as SA. Close lots more filthy coal fired generators! The place for the remaining fossil fuels is in the ground! If a Government decides to underwrite a super critical coal fired power plant and only if someone in the private sector decides to invest in coal power. It would take 6 years to build and commission a super critical coal fired power plant and then it will have to run for at least 30 years to be a viable investment. Despite the risk of the super critical coal fired power plant becoming a stranded asset it would also kill off any hope of investment in alternative power which would become redundant once the super critical coal fired power plant came on line. I just don't think anyone would invest in a super critical coal fired power plant? They might if the Libs provided a fair bit of the finance. The whole schemozzle is because the Libs can’t arrive at and implement a decent energy policy. Privatisation hasn’t helped. Jesus, Antarctica has started adding net meltwater to the oceans and the stupid Libs are STILL wanting to build coal fired power stations??? Philperth2017 wrote: I just don't think anyone would invest in a super critical coal fired power plant? the coal miners might, just to secure their demand for their products, if the govt. put in enough. If they all chipped in and joined together, no single individual or one company would have to take to big a loss . I liken it to the shop keeper who puts a product on special, at below cost price, just to drag the punters in ... his profit comes from the other products they buy whilst they're there. Poor old DDH is just as off the planet here as over there. What a waste of space and time. Typical uninformed impractical Greeny type. Why do Greeny types always try to sound as tho they know everything when they know very little and the very little they might know comes from bulldust Greeny sites. The light of reason is shining into the Libs HQ as they surreptitiously slip coal under the desk. As soon as Mal wins the election (a certainty now) he will announce the building of several HELE coal power stations using Australian clean coal. What an election winner for the Australian people and businesses starved for power. Most of the power increases are being caused by the electricity suppliers gaming the unstable power system. And the once stable coal hydro power system is being made unstable by the renewable rubbish. 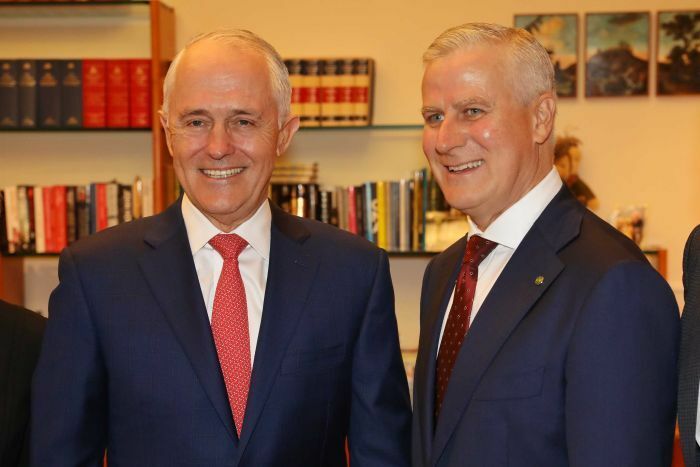 Deputy Prime Minister Michael McCormack has declared there is a “green light” for government-investment in new coal projects, as a senior cabinet minister left open the possibility of a royal commission into the electricity sector “down the track”. The competition watchdog’s key recommendation in its landmark report released this week could see the government underwrite and potentially subsidise new “firm” cheap power generation for industrial and commercial users, which may include coal. Pressed on whether he believed the recommendation “definitely” referred to coal or also included gas or other dispatchable power sources, Mr McCormack said the Coalition was “technology agnostic”. But he again said the report had provided an incentive to embrace coal — a power source championed by the Nationals and numerous Liberal MPs. “The ACCC has suggested … it could be coal, it could be gas, whatever it is, though the fact is the ACCC says it’s there, the government should and could support it where appropriate,” Mr McCormack said. Defence Industry Minister Christopher Pyne rejected claims the ACCC had suggested subsidising coal-fired power stations, after the watchdog’s chief Rod Sims yesterday reportedly said the recommendation was not targeted at coal. “The ACCC didn’t suggest the subsidy of a coal fired power station. What it said was that the national energy guarantee, which is the government’s policy, is the best chance we have to have affordable energy, reliable energy and fulfil our responsibilities under the Paris agreement to reduce our carbon emissions,” Mr Pyne told the Nine Network’s Today program. Mr Pyne, a senior moderate Liberal MP, said a royal commission into the electricity sector — which is being pushed by several conservative Coalition backbenchers — “sounded” great but slowed down the process to reduce power prices. However he said the idea could be visited in the future. “Maybe there might be such a thing down the track, but we are focusing on the national energy guarantee,” Mr Pyne said. South Australian Liberal MP Tony Pasin said it was “more likely” the government would help extend the lives of existing coal-fired power plants following the release of the ACCC report than invest in new “clean” coal projects. The ACCC’s report recommended the government enter into low, fixed-price agreements for advance, “new generation” projects. “In doing so, project developers will be able to secure debt finance for projects where they do not have sufficient offtake commitments from C&I (commercial and industrial) customers for later years of projects. This will encourage new entry, promote competition and to enable C&I customers to access low-cost new generation,” the report states. Finance Minister Mathias Cormann claimed “words” were being placed in Mr McCormack’s mouth, insisting his colleague was talking about underwriting baseload power and not specifically coal. What a blessed relief. We will be saved from arm waving DDH parroting stuff from bulldust Greeny sites from now on. One thing is for certain renewable rubbish will fail eventually as we get a month of overcast windless weather and the toy batteries are long gone flat and the tiny gas genes are starved for gas. SA shows us how hopeless renewable rubbish is - they lose the link to the Vic coal fields and the whole state goes BLACKOUT!!!! The SA renewable rubbish staggers from blackouts to brownouts every other week and ONLY the Vic coalfields saves their bacon. The erratic unstable SA renewable rubbish is a bonanza for the electricity suppliers to game the system exploiting the demand peaks as the renewable rubbish fails. Now how about a bit of Greeny lunacy. Everybody knows the Greenies' secret agenda is to sabotage the power supply to force all industry in Australia to close down. Mr Natali and his Greens seem to think they are leading the world in demanding that we shut down our coal industry and stop exports which no doubt makes the inner-city Greens feel good and morally superior to the peasants in the burbs but these city based environmental crusaders need to know the facts. Closing our coal fired plants will not make one iota of difference to emissions reduction when 564 coal fired plants are being constructed around the world today, 299 in China and 132 in India alone so Richard Di Natali’s claims the keeping our coal fire coal plant running will further damage the environment just compounds his big lie. And not when Not when coal-rich South Africa, which belches out more carbon dioxide than Britain, despite having 10m fewer people and an economy one-eighth the size. Like nearly all of its power plants, many of its vehicles depend on coal, which is used to make the country’s petrol (a technique that helped the old apartheid regime cope with sanctions). A petrochemical complex in the town of Secunda owned by Sasol, a big energy and chemicals firm, is one of the world’s largest localised sources of greenhouse gases. And not when the global climate warming predictions used by the Intergovernmental Panel on Climate Change have been overstated and have proven to be wrong, with the world warming more slowly than had been forecast by the IPCC’s computer modelling. There is now a better chance of matching the Paris agreement to limit warming to 1.5C above pre-industrial levels. And not when HELE technology coupled with Carbon Capture and Storage provide a sustainable future for the coal industry proven in plant in Texas. AGL fell into line with Mr Di Natale recently attempting to enhance its green credentials by refusing to keep the Liddell plant running; AGL is being a monumental hypocrite in this matter because this bastion of ‘corporate responsibility’ make over 90 per cent of its profits from coal and gas, while also relying on taxpayer funds to subsidise renewables! What gets me is that it seems OK to sell all our coal to other countries so they can burn it for cheap electricity but alas we cannot use it ourselves. Such lefty lunacy. The party that helps install a new HELE coal fired plant, for affordable base line power will romp in at the next election. I am suggesting it won't be either Labor or the Greens. Without nuclear power coal is the only real base-load power for industry in Australia. Simple fact. Not simple fact. Renewables are cheaper than fossil fuel and will rapidly become cheaper still. As a result of the brain trusts closing Hazelwood the Snowy is running out of water making up the shortage of power. The renewable rubbish is as useless as shoes on a snake. They’re running our largest Hydro Lake down. The large Hazelwood Coal Units closed a year ago, so the Snowy Mountain Hydro Scheme has been working hard to fill the holes in the unreliable generation that replaced it. And they’ve been collecting tidy profits from earning RET certificates too. This — levels of Lake Eucumbene have fallen to 24%. This is the lowest since 2010. It’s not the lowest ever (so that’s alright then). The rain will just fill it right up, unless there is an El Nino. Don’t look now… Odds are “above average”. Who I say, who could have predicted this?! Snowy Hydro’s biggest storage dam has fallen to less than 25 per cent capacity due to poor rains and high electricity generation following the closure of the ­Hazelwood coal power station in Victoria. Lake Eucumbene is now at its lowest level since 2010 and on its way to a repeat of 2007 when electricity generation had to be stopped in favour of a heavily ­polluting fossil-fuel generator in Victoria. The Hydro chief said they had been generating more to “take advantage of tight market conditions.” And we all know what that means. This is tough for fishermen and tourists. Alan Basford, who has been at Anglers Reach Caravan Park on the shores of Lake Eucumbene for 50 years, said things were becoming desperate. “We have been very concerned for a long while,” Mr ­Basford told The Australian.He stopped pumping water for the park three months ago and said what usually was a 3km stretch of water out the front of his property was now “just a river”. The fishing is still good but ­visitors can no longer get to the water. “We haven’t had any rain for a long time but it’s going down like mad because they are generating electricity,” Mr Basford said. 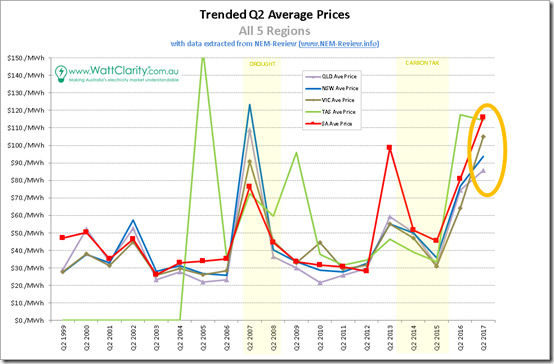 Look at what happened to Q2 prices on the NEM the last time we had a major hydro drought? See that big bump years ago? That was it. Across all eastern states. Australian Q2 NEM prices. Graph, Drought, renewables.